We’d love your help. 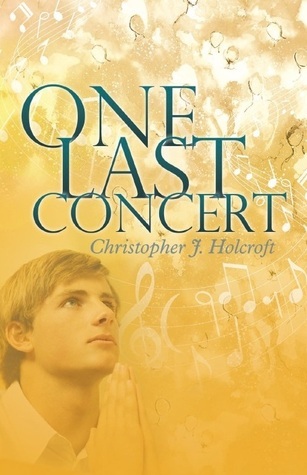 Let us know what’s wrong with this preview of One Last Concert by Christopher J. Holcroft. A group of 45 UK choristers has saved their money and are on their way to Australia to give a series of concerts down under when the unimaginable happens and they all meet an early demise. The church where the teen boys used to sing is sold off a decade later due to falling attendances and a young couple John and Melissa Sutton take over. John is a music re-recordist for a r A group of 45 UK choristers has saved their money and are on their way to Australia to give a series of concerts down under when the unimaginable happens and they all meet an early demise. John is a music re-recordist for a record company while Melissa is a music teacher. John is challenged by the spirit of one of the boys to stage one last concert for them so the boys can farewell their parents. To ask other readers questions about One Last Concert, please sign up. Once you start, you get straight into the story line, the characters are brought to life with wonderful sensitivity. This is a feel good book, and great for someone who has lost someone, as it gives you hope there is life outside of what we know. I found the book to be emotionally moving and it was a wonderful escape from life as we know. A book filled with hope, community spirit and love. I thoroughly enjoyed reading One Last Concert. It had me laughing, in tears, gave me goosebumps and the twist at the end surprised me. A heartwarming tale of newcomers fitting in, community spirit and connection; how a sense of purpose brings people together. Finished reading this wonderful book on Friday, started it on Wednesday! It should come with a warning to have tissues near at all times. The characters are so believable I was wanting to google the details of the accident and I will buy a copy of the CD from the concert! Thanks for a great read.